Even earlier today, CNBC’s Charlie Gasparino—shirt sleeves deceptively intact—was reporting on the “governing philosophy” that created the mortgage mania which in turn birthed our mortgage meltdown and, at the very least, exacerbated the broader credit crunch. He had discovered that back in 2003 Countrywide Angelo Mozilo had given an speech to the Harvard Joint Center for Housing Studies and the National Housing Endowment calling for loosened credit ratings standards and a reduction, or perhaps an end, to downpayment requirements for homebuyers. This was the speech, of course, that informed the front page National Mortgage News story we unearthed for you last Friday. Of course, accumulating funds for a down payment is one of the biggest barrier to homeownership. 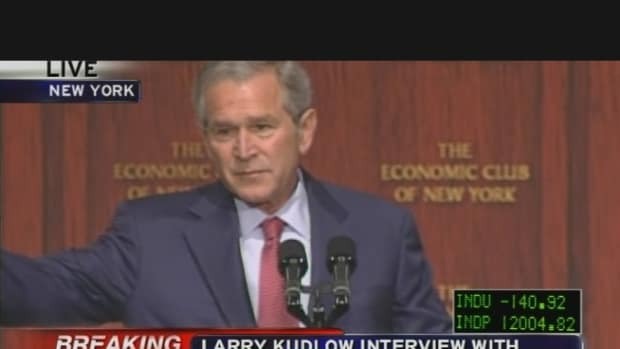 The Bush administration addressed this with both legislation and arm-twisting. It signed into law the American Dream Downpayment Fund, allegedly aimed at helping low-income families own homes by subsidizing their downpayments. It issued challenges to lenders to “close the homeownership gap” by loosening lending standards. It celebrated lenders who did this. That “Fact Sheet” was issued in connection with a speech the President gave in Atlanta, Georgia calling for “Expanding Opportunities To Homeownership.” The speech is full of the usual blather we’ve come to expect from our presidents. Education is wonderful. Immigration is wonderful. But the now peculiar focus on expanding homeownership stands out. As Bush explains it, tearing down barriers of downpayments and documentation are part of being a good, loyal American. Perhaps even a good Christian. A part of the War on Terror. I believe out of the evil done to America will come incredible good. I believe that as sure as I&apos;m standing here. I believe we can achieve peace. I believe that we can address hopelessness and despair where hopelessness and despair exist. And listen, I understand that in this great country, there are too many people who say, this American Dream, what does that mean; my eyes are shut to the American Dream, I don&apos;t see the dream. And we&apos;d better make sure, for the good of the country, that the dream is vibrant and alive. It starts with having great education systems for every single child. (Applause.) It means that we unleash the faith-based programs to help change people&apos;s hearts, which will help change their lives. (Applause.) It means we use the mighty muscle of the federal government in combination with state and local governments to encourage owning your own home. That&apos;s what that means. And it means -- it means that each of us, each of us, have a responsibility in the great country to put something greater than ourselves -- to promote something greater than ourselves. And to me, that something greater than yourself is to love a neighbor like you&apos;d like to be loved yourself. In order to change America and to make sure the great American Dream shines in every community, every community, we must unleash the compassion and kindness of the greatest nation on the face of the earth. If you don’t lend, borrow and “buy,” the terrorists, the evil-doers and perhaps the Evil Doer himself wins. And so the “fine print” was changed. The rest of the story is well known. Angelo Mozilo and others like him responded to the subsidies, entreaties and incentives by opening the mortgage floodgates. Wall Street responded to the flood of mortgages by carrying it away in asset-backed securities buckets. Investors responded by carrying those buckets. And now we’re finding that we’re all wet. In short, we checked into the Ownership Society years ago. The question now is whether we can ever leave.